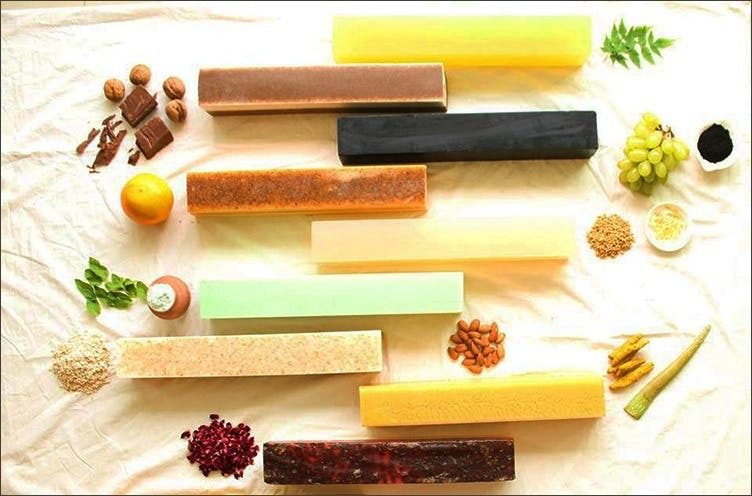 Soap Square creates quality cold process handmade soaps using essential oils, glycerine and natural ingredients which aim at moisturising the skin, as well as leaving you feeling and smelling fresh. They’ve got mini soaps, soaps shaped as fruits and put into a basket, circular soaps and of course, square soaps. Whereas most are meant for dry skin and contain aloe or shea butter in sync with ingredients such as sandalwood, peppermint, oats, vanilla, apples, winter cherry and strawberries, they also have a couple of versions for oily skin, such as the Neem and Tea Tree Oil and the Lemon Peel with Aloe Butter. They also have a gigantic rectangular soap bar called the Family Soap. Whereas we’re not sure we’d love to incorporate this hunk of a soap in our bath rituals, it does make for a great gift and you can always cut it up into smaller, more functional pieces. One of their signature products is the Lotion Bar. A circular solid chunk of shea butter, this is used post-shower on damp skin. You just have to rub it in. We’re getting some for long flights where we can’t carry liquids and for lazy moments, of course. They keep doing special hampers and baskets for occasions such as Diwali, Christmas, Valentine’s Day so keep an eye out on their page.